Dr. Anuradha Patel has been recognized as a “Leader in Medicine” among “America’s Best Doctors” for 2017. She will be sharing her knowledge and expertise on Pediatric Anesthesia, Neuromuscular Disorder, and Preoperative Anxiety. With more than thirty-five years of experience in the field of Medicine, Dr. Patel became involved in the specialty of Pediatric Anesthesia due to her amazement at how children took their illness with stride. Dr. Patel serves as an Associate Professor, Clinical Director and the Section Chief of Pediatric Anesthesia at Rutgers New Jersey Medical School. Her day-to-day responsibilities include training residents, teaching, mentoring, consulting with several divisions and creating the curriculum for the Pediatric Anesthesia residents. Dr. Patel earned her medical degree from Netaji Subhash Chandra Bose Medical College, India in 1978. Dr. Patel is a Fellow of the Royal College of Anesthetists and a Diplomate of the American Board of Anesthesiology. Dr. Patel maintains affiliations with the Society for Pediatric Anesthesia, the American Society of Anesthesiologists, and the New Jersey State Society of Anesthesiologists. She volunteers with the Foundation of American Association of Physicians from India and programs geared towards battered women. Dr. Patel attributes her success to dedication and support from her family. 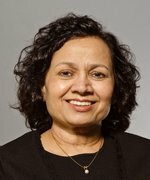 She believes one should be willing to fight for change and take action instead of complaining.. Dr. Patel’s commitment to excellence has led to the recognition of Arthur Kahn Memorial from Faculty in addition a recipient of Golden Apple Teaching Award. Among her many accomplishments, Dr. Patel is honored to be a role model for young physicians and both of her children who happen to be doctors as well. As a national recognized expert on neuromuscular disorder, she has served as a CDC expert panel on Duchene Muscular Dystrophy. Looking ahead, Dr. Patel hopes to continue her roles as an advocate for Pediatric Anesthesia and inspire the next generation of pediatric anesthesiologists. In her free time, she enjoys painting and traveling. Dr. Patel is fluent in Hindi and Gujarati language. The New Jersey Medical school is devoted to the education of students, physicians, and scientists to meet society’s current and future healthcare needs through patient-centered education; pioneering research; innovative clinical, rehabilitative and preventive care; and collaborative community outreach. The Division of Pediatric Anesthesia has a mission serve as a resource for University Hospital and its administration regarding the provision of sedation to children outside the operating room. The Division of Pediatric Anesthesia operates within the Department of Anesthesia and has a mission to provide pediatric anesthesia care that exceeds community standards and incorporates all currently available technologies and techniques, to educate residents through hands-on patient care as well as didactic lectures, and to afford opportunities for clinical research in pediatric anesthesia techniques, outcomes, pharmacology, and other germane issues. Luay Susan, M.D. David Feingold, M.D.